Are you considering buying cremation jewellery to remember someone special? Memorial glass jewellery can be a beautiful way to celebrate the memory of a loved one, and keep them close to you. As an experienced glassmaker, I see these special pieces of jewellery bringing happiness and comfort to people on a regular basis – it’s part of what makes my job so worthwhile. But what’s so comforting about cremation glass jewellery? Well, the best people to really tell you that, are the ones who have already experienced it for themselves. Below are some of the comments from my own customers who have had memorial jewellery made either for themselves or a family member. Creating memorial glass jewellery really makes me feel like I’ve made a difference, and it’s a lovely thing knowing you’re bringing that comfort to someone. It gives people something they can keep hold of forever, bringing them comfort on even the darkest of days. And there’s definitely something to be said for the fact that no matter where they go, they can take their loved ones with them. Memorial jewellery can also be a great comfort for those who haven’t necessarily chosen a traditional route when saying goodbye to a loved one. One example of this is Rosemary McCallum, who said: “We lost my Dad just over 3 years ago now, he had donated his body to science and we recently received his ashes back. Without having had a ‘normal’ farewell process my mum took some time to decide what she wanted to do. She felt absolutely that it was the right thing. 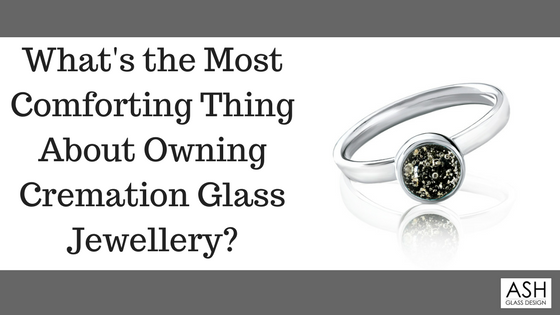 In my experience as glassmaker, and the nature of the work involved when making cremation glass, you have to take so much care in what you’re doing – knowing that one piece of jewellery will mean so much to its recipient. Saying that, the processes between different companies will vary, and experience is so important. If you’re looking for a reputable memorial glass company you can trust, the best advice I can give you is to thoroughly research different products and companies online. When you find a product you really like the look of, write down any questions that stick out to you, or use this blog post as a guide. The best way to feel confident you’re making the right decision is to call up and speak to someone over the phone. A good cremation glass jewellery company should hopefully be happy to answer your questions, and ease your mind, BEFORE you commit to buy. Finally, buying cremation jewellery can be a stressful experience, so check out my blog post entitled ‘5 Ways to Avoid Stress When Buying Cremation Glass Jewellery’. Thank you for reading. If you think you or a family member could benefit from the comfort cremation glass jewellery can bring, I’d urge you to take a good look at the different types of memorial jewellery available. And always ask to speak to a company before committing to buy – they should be happy to answer your questions. Do you want to know more about memorial glass jewellery? Feel free to leave a question in the comments, or alternatively get in touch with me directly. I’d love to hear from you.